One of my favourite foodie-medicine people, Kevin Gianni of The Renegade Health Show, ended a New Year post with a list of 7 Things he Learned This Year. This is a popular topic for his readers and you might want to look at it yourself... just go here. Kevin learned that food-- or maybe more explicitly-- the way and what foods one eats really is only a small factor in health. He learned that "you are what you eat" is more accurately stated as "you are what you digest" (or as a colon therapist states it: "You are what you assimilate and do not eliminate"). Kevin went on to state that the high point of his mother's year was her improved digestion because she boosted her stomach's hydrochloric acid and started a regular regimen of digestive enzymes. My husband is a super online researcher. He will google and google and when he finds long articles with lots of scientific vocab seeded throughout, he will actually read them! When he felt that he was not digesting his food well he went on a search for what might be key to turning that situation around. He had gas, he didn't feel that he rested well at night, and he was more sensitive to certain foods than he had been in a long time (i.e., dairy products and possibly wheat). We were paying attention to food combining. We were pretty much what you would call "high raw" (meaning that about 70% of what we ate was fresh, organic, living whole foods-- fruits and vegetables). What followed all the initial googling was a festival of reading about digestive enzymes. Ed (my husband) is quite physically active by which I means he bikes, hikes, runs, and marathons. We started adding digestive enzymes into our life (usually 1 or 2 multi-enzyme caps) whenever we eat a cooked meal. His digestion improved considerably and he found that he had more endurance, was able to lift significantly more weight (in working out), and cut minutes off his long runs. Around the same time we began to recognize that wheat pasta, bread and buns and cake, etc., left us feeling heavy, bloated, and without energy. I began some tenuous movement into cooking more with quinoa and eating less of wheat products, at least at home. 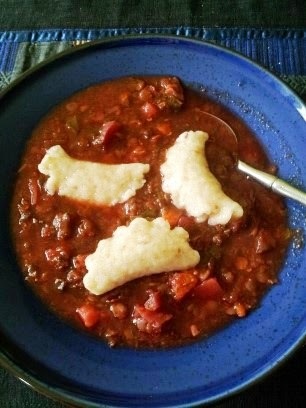 Sometime in the Fall we decided, "this is enough of this" and began to make a true effort to cook and eat gluten-free. And to take digestive enzymes to aid in digestion. Digestive enzymes break down the complex molecule structures of food so that the body can better absorb the nutrients. Human digestion takes place mainly in the oral cavity (mouth), stomach, and the small intestine. Digestive enzymes are secreted by different glands such as salivary glands, secretory cells in the stomach, pancreas and small intestine. Fresh fruit and vegetables have enzymes intact for this process. When food is heated above something in the range of 118 degrees Fahrenheit, the digestive enzymes in the food are destroyed. As we age, some of our body's own enzyme-producing functionality is significantly reduced. Too, the quality of soil nutrients has diminished so that most fresh fruits and vegetables don't provide the digestive enzymes they did years ago. And how many people actually consume nine servings of fruits and vegetables a day, let alone nine raw ("living") servings that would contain enzymes? When gluten is ingested by people with Coeliac (celiac) disease, the upper small intestine is damaged and prevents nutrients in food from being properly absorbed. 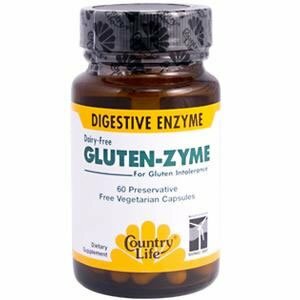 A recently developed "enzyme cocktail" of enzymes EP-B2 and PEP allow persons with celiac disease to handle some of the "hidden glutens" in their life without the irreversible damage they would ordinarily suffer. The product Glutenzyme, produced in the UK, is an enzyme protease that has the ability to break down gluten protein. Although persons with celiac disease are cautioned to take this enzyme formulation as a way to deal with minor "hidden" gluten ingestion, persons who are less gluten sensitive are finding that if this is taken before meals they are able to digest gluten. Check with your health care professional/health food outlet to see if these are available in your community. You might also be interested in this interesting article by Rebecca Shannonhouse: Digestive Enzymes May Be Your Answer to Heartburn, Gluten Intolerance, Flatulence—and Even Arthritis. What do you recommend for daily enzymes?